AUTISM ACADEMY – At the Autism Academy, a school for children with autism, we encourage our students to go after their passions. This is why this article is so unique to many of our other blog posts. We feature a special writer today from our school for children with autism. Read on, to find out how our students are extraordinary and passionate. Most schoolchildren and adults alike usually hate writing, but students with autism spectrum disorder (ASD) have specific challenges that impact the writing process. More important than pretty letters, writing requires four important skills; language, organization, motor control and planning, and sensory processing. All of these areas are problematic for many children with ASD. Even simple literature assignments trigger potential meltdowns. But Jakob Gronseth, an 11th grade Autism Academy student is stepping up and speaking out through literature. Writing is a critically important skill that affects student’s ability to graduate with a diploma. Writing requires the kind of creativity and concentration that can lead to negative responses, refusals, and meltdowns. These responses can even be experienced in children who do not have ASD upon receiving writing demands. Research shows that helping children with autism write will require teachers and parents to provide support in the areas of four important skills. First, language barriers can be overcome by allowing students to select their own opinion-based topics. This will help students who have great ideas, but find putting their thoughts and ideas on paper very challenging. Secondly, organization usually affects learners with ASD because of their struggles sequencing thoughts. Drawing a visual-support timeline or numbering the sequence of events in chronological order, and then verbally rehearsing it, will help with a logical flow of the literature. Thirdly, motor control and planning will often prevent a student from getting started. Slowly place your hand on the child’s hand, guide the writing process until the student starts participating, and then slowly remove your hand. In addition, for computer savvy students, try using a keyboard. Lastly, sensory processing is important for students who have meltdowns every time they are instructed to write. Simply allow the student to take breaks between writing every three to five sentences to regulate his or her senses. During these breaks, many students with ASD will need to do a different type of sensory activity before restarting the writing process. 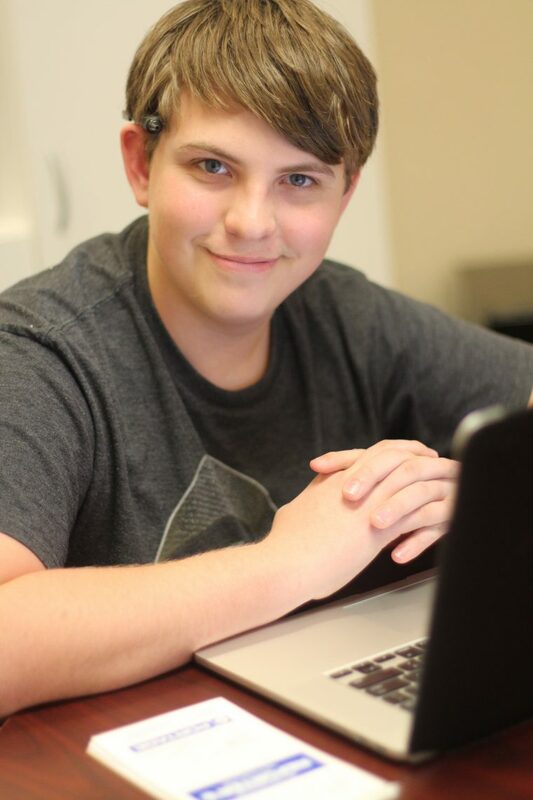 Writing with autism has its challenges, but Jakob is proving to peers that students at the Autism Academy are uniquely brilliant. If you’re looking for a school that will help meet your educational expectations for your child with autism, the Autism Academy will help give your child the life skills he or she needs to be successful. My name is Jake Gronseth and I attend A+ Academy as an 11th grader because I have autism – it is one special trait about me. Telling people I have autism is important to me because it shows how unique I am as a very talented writer. In my opinion, people with autism just have their own special way of dealing with problems. They all differ in what ways they solve them. Children with autism clearly think differently from those that do not – this is what makes us unique. I have the patience of an ant, my attention span is really bad, and I have a very difficult time understanding social cues. Ordinary people think that kids with autism are too dumb to learn and have severe brain damage. Truth is, we are extraordinary. I have seen people who can’t even count to ten, but they are still amazing. Some are incredible math savants, athletes, musicians, and have other unique traits. Personally, I love writing literature, typing, and role playing. Upon testing, I typed approximately 37 words per minute. When freestyling I timed-out at about 51 words per minute. Usually, I write fanfiction, that’s what I enjoy writing. I customize characters into my own and use role playing to write about them. For me, it’s difficult creating story ideas. It is also difficult to transition throughout paragraphs and describe things. I prefer to have some background noise because it helps me focus – it’s just how my brain is wired. Considering that my brain is wired differently, I didn’t fit in well at my old school. I was bullied, treated rudely, called unkind names, and the worse part is that even the teachers didn’t seem to like me. I felt like I was just an obnoxious and stupid kid in their eyes. However, now that I go to a school where I can be myself, the A+ (Autism) Academy, I am much happier, and now I have an appreciation for who I am. Recently, I met our school blogger, who is also a former journalist that wrote for the Chicago Sun Times and other newspapers. He met me when I went to get a drink of water – I came to know him as Mr. Anthony. After meeting him, he agreed to meet with me sometime soon about writing articles. I did not expect it to actually happen, but he came. Now, he has dubbed me as the first student reporter at the Autism Academy in Tempe, AZ. It feels great to have met someone that appreciates me this much and is willing to help me become a better journalist. Look out for more student interest articles from Jakob Gronseth.